Projects objectives. They are project manager’s best friend and curse. A tough love. The conventional wisdom wants project objectives to be SMART (specific, measurable, achievable, relevant, timebound). You can find many useful references on how to make them SMART in all project management books and methodologies. We arrive at the project objective through needs assessments and inclusive consultations, I hope. We write the project objective in the project doc. And we forget about it. Until reporting time knocks at the door or rather sends a reminder these days. 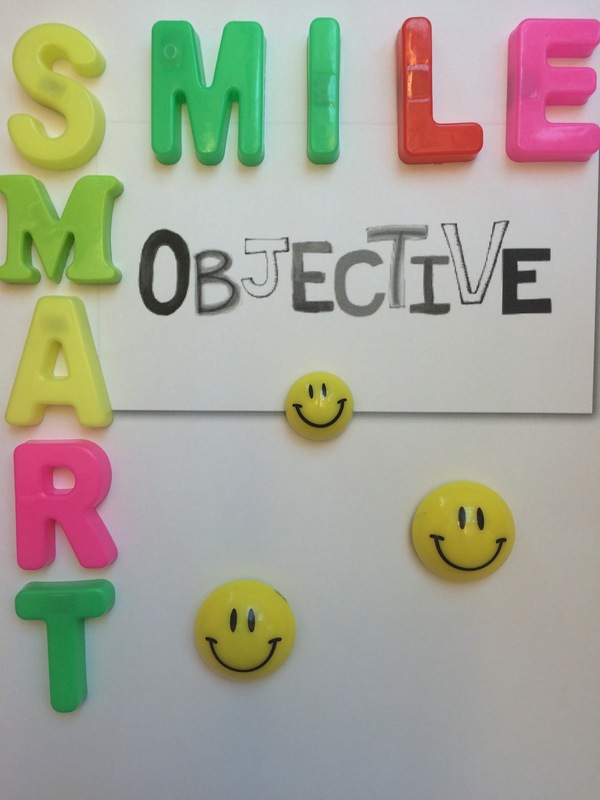 I echoe the need to have SMART objectives. I also like them to smile. If possible. Why? It is perhaps easier to stay loyal to a SMART and SMILE-ing objective. E – environmentally friendly, as in “do no harm”. – Will the sky fall if I take a two week leave, boss? I asked my former programme manager some years ago. – Yes, he responded abruptly. He still let me go. I suspect it was because I mentioned I am traveling to France, his home country. And the sky did not fall. To the contrary, stars were brighter upon my return as I came back refreshed, full of impressions. My happy brain and the fairy creativity renewed their vows. My productivity increased. It lasted for a good half a year, a critical time for the change management we were implementing in a big private bank. In 14 days we travelled 2000 km from Paris to San Remo and back, visiting 3 countries, stopping overnight in locations on our route, enjoying the hospitality of new hosts every evening. It was a travel in time, as our itinerary included the Pont du Gard, an ancient Roman aqueduct that crosses the Gardon River in southern France and Arena of Nîmes, a Roman amphitheatre, built around AD 70. Visiting ancients sites puts things into perspective. For example, is that internal chatter about the perfection of the new marketing strategy important in the big scheme of things of giving to the clients the good product they expect? These lasting monuments reiterate what we know and tend to forget: things that last are not build in one day and not by one person. A change of scenery decluttered the busy brain. Colours took over numbers running over and over in the brain. Scents and sounds put office chatter to sleep. Deadlines surrendered to Sunrises and Sunsets. “….What can we learn about how to take leisure time from these true masters in the art of living? Move and exercise. Evolutionary science tells us that our fancy brains developed not while we were lounging but while we were working out. Our ancestors moved around all the time. And we should use our holidays to do the same—especially those of us in jobs that keep us at meeting tables or desks all day. Find peaceful, beautiful surroundings. Nature not only helps you listen to your inner voices; it can also inspire new purpose and passions. My wife María and I were walking through the solemnly beautiful Júcar Canyon in Castilla-La Mancha, when we decided to move from Madrid to Buenos Aires so I could make the most important and successful job change of my life. Meet different, interesting people. In one of Leonardo da Vinci’s notebooks, there is a to-do list of 15 tasks. At least eight involve consultations with other people and two focus on other people’s books. The world’s most productive people are deeply curious and collaborative and constantly seek out new acquaintances and allies – even when they’re on vacation. Be willing to invest. Many of us are biased toward tangible luxuries. We spend more on houses, cars, clothes, and other things, which very soon lose their initial attraction and generate all sorts of worries and maintenance needs, than we do on experiences, which, according to research, offer more long-term satisfaction, providing not only pleasure but also a chance to learn and grow. Quality vacations are one of the highest-return investments you can make. Every morning as a newly wed i used to do something mildly evil. I would wake up before my husband, keep my eyes shut and pretend to be still asleep. He would be moving around the apartment, waiting for me to wake up. He would eventually succumb to his need to eat and go make breakfast. Why did i do that? Both of us grew in an environment where women cook, men eat. I was not going to succumb to this traditional expectation and bring it into our marriage. The result? For more than 15 years the breakfast is a fun and pleasant experience for both of us. Similarly, in projects, project managers have to deal with expectations. I say ‘have to’ because otherwise projects risk acquiring the “scope creep” disease. The project scope creep is a rather moody beast. Your client might not care about “your scope”. The beneficiary wants it big, shiny and now. The sponsor’s demands change and go up. Or the sub-contractor suddenly appears at your door with an invoice 3 times bigger than the initial estimations, while trying to sell ‘new features”. All – easy ways to make the initial project parameters become XXL, or gi-enormous, as my daughter calls things, which are unreasonably large for her taste, while the budget will stay on XS. Documenting and communicating on project requirements help on the prevention side. Yet, sometimes, people get creative and as fine as a scope guardian as i would like to believe i am, additional demands appear on my radar screen. In time, i learned that my finest ally in this pressure attempts is the approved Project’s Objective. Is the new demand in line with the Project Objective? For example, a beneficiary wants training on a particular skill for some members of the organisation not involved in its management or development and the project’s objective is institutional strengthening. If the demand passes the “objective test”, i submit it to the “budget test”. Is there enough money? If yes, is the expenditure an eligible cost under the financing rules? Further on and in case of necessity, if the budget test gets the demand cleared, then the impact and cost-efficiency tests apply. I am a lawyer so maths and econometrics are not my strong point but I would get advice. Finally, you do not need to be a solo-decision maker in this case and appear as the ‘bad guy’. To kill or manage the scope creep beast, you might need your superiors or the project’s steering committee. A justified No will help them decide. Then, when you know the answer or the decision is made, invest time in communicating back to those who placed the demand. I also learned to say No from the beginning, when signs of project creep appear. In a polite and firm way. It is also good for risks management. If you are looking for some inspiration on why and how to say No, “The Power of No: Because One Little Word Can Bring Health, Abundance, and Happiness” by James Altucher and Claudia Azula Altucher, 2014, can provide some insights into the healthy No. Are project managers allowed vacations? – It’s vacation time, buddy, sais my brain to my body. Hello! Is any one home?! The body, rather unimpressed, walked into the office building. I shortened my vacation by a week. A wealth of studies tell me why it is not good. Neither for me, my family nor for my organisation. The good news is I’ll still have a vacation, even if a week later. So back to the question in the title. A Project manager on vacation? Unheard of! Tight deadlines, impatient clients, strict sponsor, plenty of adrenalin, which keeps you going, and plenty of other imposed or self-imposed excuses. The key is in the planning. As in projects. So for a start, let’s do ourselves a favour and be good project managers of our own vacations. Vacation planning tends to bring happiness as shown by research in the journal “Applied Research in Quality of Life”. People actually derive most of the happiness from their vacations in the planning phase (http://www.nytimes.com/2015/08/18/opinion/what-your-vacation-says-about-you.html?smid=fb-nytimes&smtyp=cur&_r=0). You can easily guess who plans and organises my family’s vacation. I love to search for new destinations, read hotels reviews, make ‘hotel tenders’, book, make a list of things to experience, argue with my family about what not to put in the luggage (gadgets, for once). It is fun and it pleases the annoyed fancy brain, so it can deal with deliverables, milestones and other projects demands. In parallel, a pre-vacation work planning will bring peace of mind. The key is to assess and prevent any foreseeable issues, to the extent you can. Announce as soon as you know your away days to anyone you work with. Think about replacement. Will any other project manager replace you while you are away? If yes, leave clear instructions on matters to follow-up and a list of “in case of…” in a hand-over note, which is also communicated to your supervisor. Will there be no stand-by officer? Make sure your out-of-office automatic reply is clear about it and gives directions to people who still need your input/feedback. Decide if you will you be available by email/phone. A wealth of studies show that it’s best to fully disconnect. Dropping ‘accidentally’ your mobile device in the pool is one option. There are less financially costly ways. Good pre-vacation planning will facilitate the full disconnect. So far, my personal record of ‘no-emails-checked’ is 3 days. If you still need to check your email, make a deal with yourself to check it only at a certain period of the day for a certain amount of time (e.g. 1 hour after kids go to sleep). If you stick to it, reward yourself with a large ice-cream or beer. Or both.